Well, I was breast stroking. It’s important to keep up a habit of swimming every day, even if you’ve had a late night. When we exercise, the body unleashes a cascade of biochemical changes that have massive health benefits. How the body does this remains largely a mystery, but plenty of research scientists are working on it so that they can develop a pill that mimicks these processes. In ‘Annals of Science’ in The New Yorker (6 November 2017, pp. 30-35) Nicola Twilley investigates a drug that confers ‘the beneficial effects of exercise without the need to move a muscle’. GlaxoSmithKline spent much money on developing such a pill. But in 2007, just when the pharmaceutical company was about to begin Stage III trials (the big, expensive, double-blind ones required for US Food and Drug Admin. approval) the results of a long-term toxicity test came in. The mice that had been given the pills had developed tumours ‘all over their bodies, from the tongue to the testes’. Needless to say, pharmaceutical companies are not giving up on developing this potentially most lucrative of all drugs. Meanwhile people can continue to swim, cycle, hike, play ball games, do circuit training or whatever physical activity they prefer. It’s unlikely that those of us who do these things would take an exercise pill instead even if it were available and free of troubling side-effects like cancer all over our bodies. Exercising makes you feel fantastic. We’re going to keep doing it. Not only does it have wonderful physical results like toned muscles but also social benefits. These confer emotional and mental improvements, which would probably not happen if we lay on our sofas and took our exercise pills while we watched Game of Thrones. My favourite exercise is swimming. I’ll swim anywhere – in creeks, dams or the ocean here; overseas in the Sea of Galilee, the Hampstead Ladies’ Bathing Pond or the Dead Sea. In Australia, a summer wouldn’t be a summer without swimming. If you can’t get to the coast, a river, lake, dam or swimming hole, there’s usually a local council swimming pool not far away. And the summer wouldn’t be summer without more time to read. This post would be too long if I summarised every book I’ve read so far this summer. Also, some have been depressing (politics and the analysis of the dismal consequences of 30 years of neoliberal economic policy) and I found myself with a rare feeling of writer’s block when I contemplated writing about them and their complexities. Actually it was more of a writer’s reluctance – life is short and I’d rather spend my time swimming! So what a serendipitous start to the new year it was to open writer Andrea Goldsmith’s latest blog. I was uplifted by her description of what drew her out of a depressing sense of time being in short supply once one reaches a certain age. 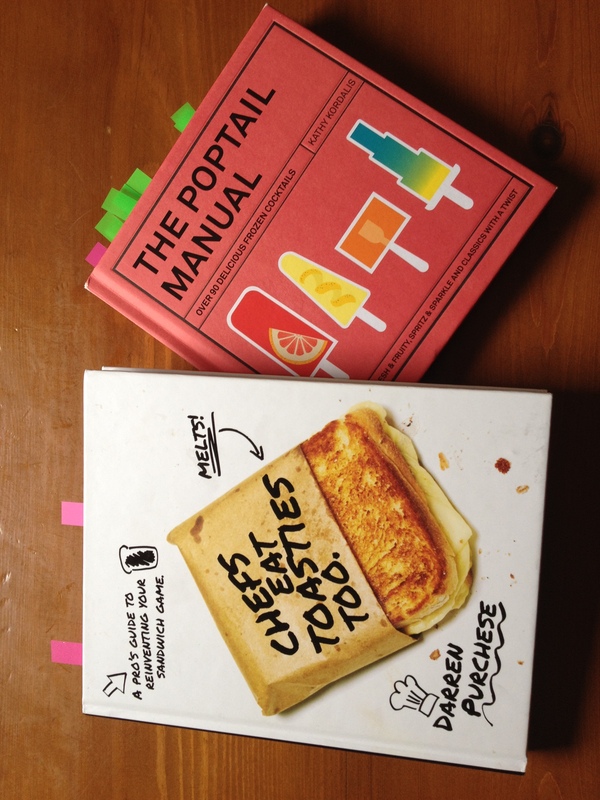 I’ve also been spending uplifting time on creating the recipes from two new cook books I found irresistible for the summer: The Poptail Manual: Over 90 delicious frozen cocktails by Kathy Kordalis and Chefs Eat Toasties Too: A pro’s guide to reinventing your sandwich game by Darren Purchesse (both published by Hardie Grant in 2017). Check out the ‘Dark chocolate, olive oil and Murray River salt flakes’ toastie in the latter on p. 122. Savoury or sweet – every toastie I’ve made from this book has been wonderful. Of course all this swimming and reading and making alcoholic paddlepops has not allowed much time for writing. And I don’t have the excuse made by Dorothy Parker of the famous Algonquin group. One summer in roughly the middle of the 20th century, the writing group rented a coast house for some weeks of reading, thinking, swimming, talking, drinking and of course writing.